Wabash College is saddened by the passing of long-time and beloved Professor of Religion Hall Peebles, who died Thursday at the age of 81. A native of Augusta, Georgia, Hall taught at Wabash from 1958 until his retirement from the College in 1998. The man students referred to as “Yahweh” because of his dramatic (and precise) Old Testament lectures was graduated from the University of Georgia with a philosophy major. He attended Yale University, where he received his bachelor’s of divinity degree, and his master’s and Ph.D. in theology. 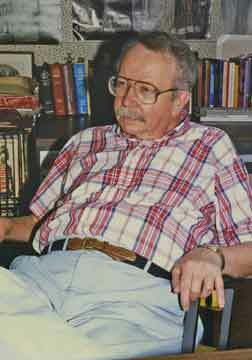 Read alumnus Adam Pope's biography of Dr. Peebles, written in 2003. In 1991, the National Association of Wabash Men named him an Honorary Alumnus. He was also the recipient of the McLain-McTurnan-Arnold Excellence in Teaching Award. He was preceded in death by his wife, Emma, who passed away in 2009. Survivors include their sons, David, John, and Mark. Dr. Peebles was a frequent Chapel speaker and preached Sunday worship services in the Chapel throughout his career. His lectures on the Old Testament were broadcast on local cable television. He was also an expert on Far-Eastern religions. “His knowledge of Daoism, Confucianism, Legalism, and Buddhism bring Wabash College students closer to a cultural understanding of China and Japan,” said Dean of the College Paul McKinney in 1984. He was celebrated and even legendary for the grace in which he served as Secretary of the Faculty. He also served as chairman of the religion department and was a co-chair of Cultures and Traditions. 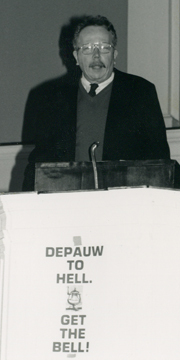 In 1988, Dr. Peebles presented the Ninth Annual LaFollette Lecture in the Humanities: “Heaven, Hell, and Holy War.” But perhaps his most beloved remarks were his spirited Monon Bell pep talks, and in particular, his “Tribe of Dan” speech, which did more to inspire 800 men to laugh like children than to take to the gridiron with appropriate intensity. Dr. Peebles was a member of the American Theological Association, the Society of Biblical Literature, and served as president of the Indiana Academy of Religion. He received a Ford Foundation Faculty Fellowship to conduct research at Yale University and later did research in Switzerland. Read this Wabash Magazine tribute to Dr. Peebles at the time of his retirement.